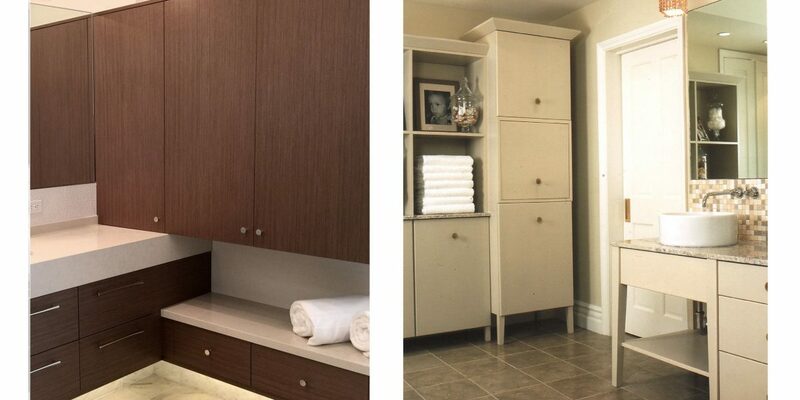 BATHROOM CABINETS: STAINED OR PAINTED? As a designer, I get asked this question all the time. What’s better (or more in style, or what do most people expect), stained cabinets or painted cabinets? You would think that the answer would reflect my knowledge of the industry, or some profound professional insight. Strangely, though, the answer has more to do with the color of a clients’ existing cabinets. That is, if you currently have stained wood cabinets, then you probably want to rip out those dark, heavy cabinets and replace them with something light and bright. And if you have painted cabinets, then you probably want to rip out those cheap, flimsy cabinets and replace them with something rich and substantial. When you are thinking about a bathroom remodel, your mental photograph of your existing bathroom (and all that you like or don’t like about it) is hard to ignore. Of course, there is no one right answer to the wood/paint questions, just as there is no one perfect countertop for every vanity, and no one perfect bathtub for every homeowner. I just have to remember, when my paint-cabineted clients look at me with concern and say, “Painted? Won’t that look cheap?”, that whether they realize it or not, their thoughts are anchored in their “house history”–the house they grew up in, the houses they’ve lived in during their life, and yes, the house they live in now. Oh–and yes, we are doing more painted cabinets in both kitchens and bathrooms right now.